ATTENTION Iphone/iPad/iTouch USERS...click HERE to install the CigarShopLocator app on your device, or go to the iTunes App Store and search for "CigarShopLocator". ATTENTION ANDROID USERS...click HERE to install the CigarShopLocator app on your device, or go to the Android Market and search for "CigarShopLocator". ATTENTION WINDOWS PHONE USERS...click HERE to install the CigarShopLocator app on your device, or go to the Windows Marketplace and search for "CigarShopLocator". 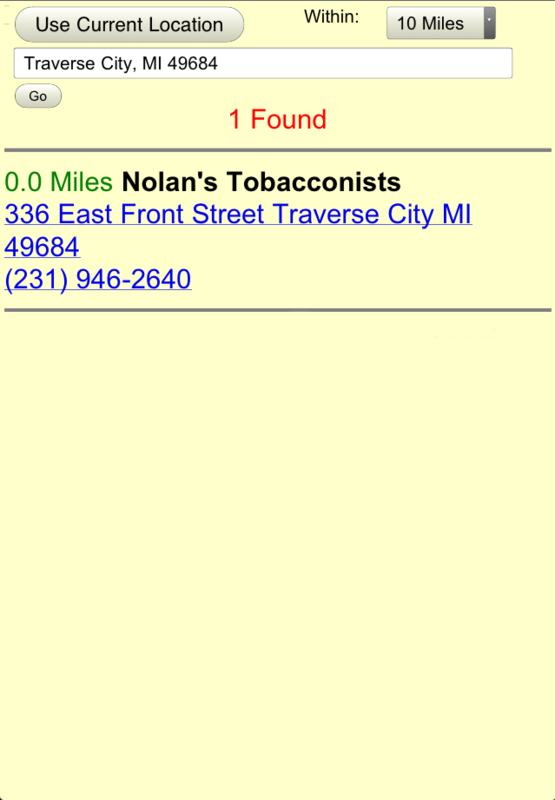 The CigarShopLocator App will let you find cigar shops that are near you or near a location of your choice. Basic information, how far you are from the shop, name, address and phone number will be listed. Enhanced information such as email, website, hours, onsite smoking, brands, events, picture and coupon may also be available. RETAILERS: Go to www.CigarShopLocator.com/JoinONLINE or send an email to info@CigarShopLocator.com to find out how you can get an ENHANCED listing. CigarShopLocator is in Beta testing. It is designed for iTouch, iPhone and iPad, but we have had reports that it also works on some Android devices as well as desktop browsers. When you use the "Use Current Location" button, an attempt to locate you via GPS, cell tower triangulation, or wireless location will occur. Accuracy will vary. 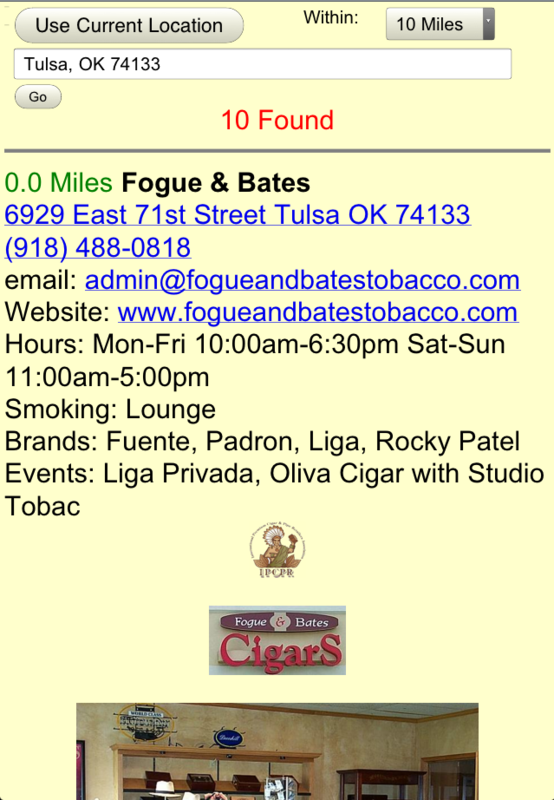 A list of Cigar shops will then be listed. If you type a location in the text box just above the “Go” button, the system will use that as your starting point for creating a list of Cigar Shops nearest to that location. 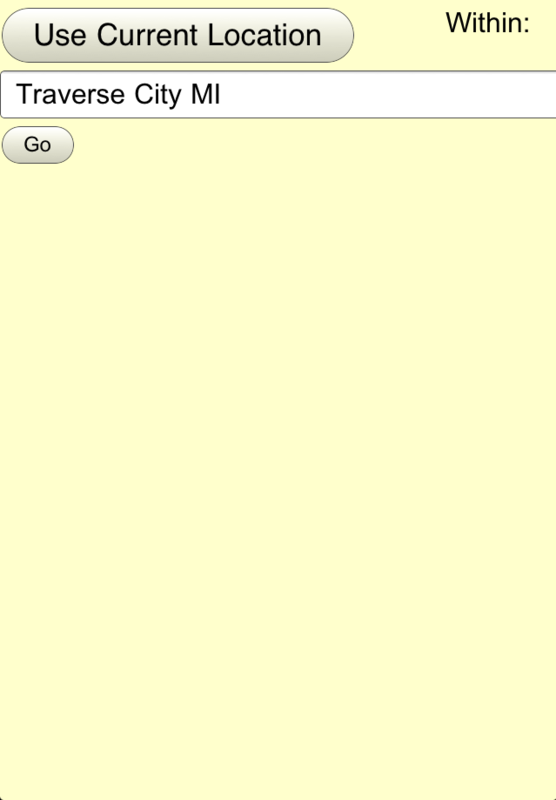 Use the “Go” button to display the list. 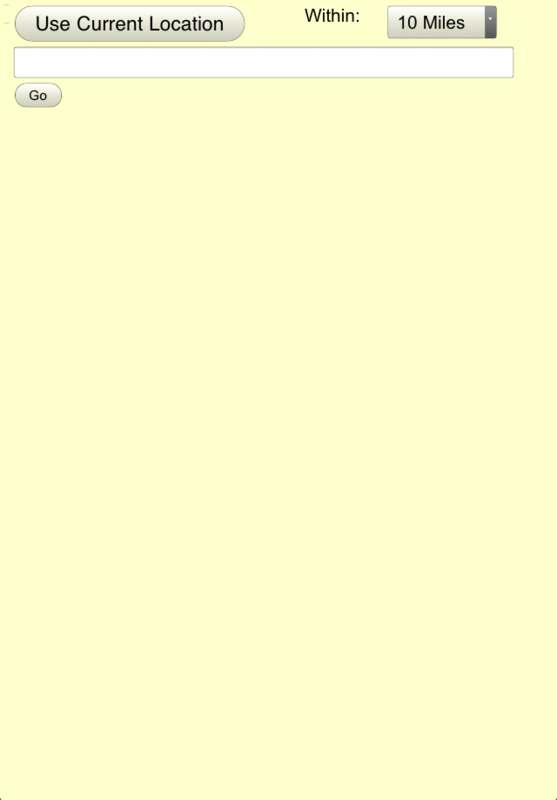 HINT: you can type in a Street address and/or City and/or State and/or zip. For example, if you type in TX, the starting point will be at a city in the middle of Texas. Using the list of “Within: Miles”, will allow you to expand your search to a desired radius of your position. Some Cigar Shops will display pictures and more information than others. If you touch on the Cigar Shop’s address, it will launch Google Maps to pinpoint the location. You can then use Google Maps options to get directions, show street views, etc. If you are on a phone device, when you touch a phone number it will ask if you wish to dial that number. You can follow us on Facebook (CigarShopLocator) or on Twitter (@CigarShopLocato) (yes, the "r" is missing).